Welcome to the Literary Road Trip and my Spotlight On . . . Janet Lord. I am so pleased to feature Janet this week as another Pennsylvania author for the LRT project. Janet wrote the story for Albert the Fix-It Man, which I reviewed yesterday. I was so taken with her book that I asked Janet if she would answer some questions about Albert and about being a Pennsylvania author. Beth Fish Reads (BFR): There were several good lessons in your book, but one I really liked was that it teaches children to respect a tradesman. So often the beloved townsperson is a professional (doctor) or a someone in uniform (firefighter) instead of a person who can help with normal, day-to-day problems. I loved the fact that Albert is a handyman who is able to save the day and who is everyone's friend. Did you think about this when you wrote the book? Janet Lord (JL): I definitely thought about this as the story formed in my mind. It’s true, the professionals and the uniformed often get their day in the sun, but our communities are also peopled by valuable tradesmen who do hands-on work, who take pride in producing useful, tangible results that help people in all sorts of ways. They make our world infinitely better by building, fixing, and creating. These heroes come to the rescue to solve problems and make people’s lives better on the spot. And, through their attention to individuals, neighborhoods are woven together person by person. They are creative, self-reliant, resourceful, and possess a can-do attitude. I treasure such people including my husband who is a highly skilled carpenter. Additionally, I rebel against the whole idea of a throwaway culture and isolated living. I enjoyed showing a character that doesn’t settle for that approach, who finds new life for objects, and who illustrates the benefits to be gleaned from commonsense problem solving, and who helps those around him as he strengthens his neighborhood. BFR: Albert is such a sweet man and knows how to fix everything. Is there an Albert in your family or did you know an Albert when you were growing up? JL: Yes to both questions. Albert is my father. A mechanical engineer by training, he is just like the Albert in my book. He loves any challenge that involves helping a person, keeping an object useful, saving money, and involving some simple, though ingenious idea. He is never too tired, never too busy, and always comes up with a way to help. Albert (real and fictional) demonstrates the manliness of generosity, kindness, and strength of character. Albert’s neighborhood shows that everyday heroes are valued and beloved, and that everyone has some hero in himself or herself. 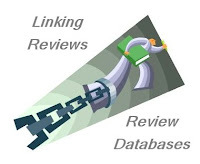 BFR: It is so interesting to me that you wrote the book and your sister, Julie Paschkis, illustrated it. Tell me a little about how you two decided to hook up professionally. Did you create books together when you were children? JL: It has been wonderful to create this book with Julie. Our mutual childhood was a hotbed of books, art, building, talking, and writing, thanks in large part to the creative influences of our parents. Creating books was a natural dream for those with an imaginative, rich upbringing. We wrote, drew, and played make-believe, sometimes, though not always, together. Julie had become an established illustrator, and I was a graphic designer when we collaborated on our first effort, Here Comes Grandma. That sprang from a phone conversation. When I told Julie the germ of the idea, she could imagine illustrations. The rest is history. It was fun, and we wanted to do more. When the idea of Albert the Fix-it Man came to me it was a similar process. It works like this: I write the story and Julie creates a basic plan for the illustrations. I send the manuscript off, and soon it returns, with amazing, beautiful paintings by Julie, that are perfect. 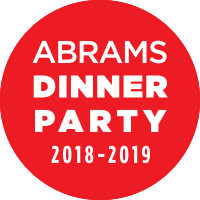 I believe there is a creative family core that makes our two parts work together well and we have been very lucky to have an opportunity to create books. BFR: You currently live in the greater Philadelphia area. How has living in Pennsylvania influenced, helped, or hindered your life as an author? JL: Living in the Philadelphia area has been a positive influence. At the center is a beautiful, diverse city. The city and surrounding area was home of the quintessential fix-it man, Benjamin Franklin; the Arts and Crafts great Henry Mercer; early botanists including John Bartram; authors/illustrators I loved including N. C. Wyeth, Marguerite DeAngeli, and Edgar Allan Poe. It’s where the documents that established our nation were written. The area was filled with individuals who exercised their creative muscle, took chances, learned from the world around them, and contributed, giving back in full measure. It still is an area that is rich with creative spirit and opportunity. Writer’s groups abound. In Philadelphia I am never far from a great museum, park, or library . . . inspiration is all around me, ripe for absorbing. There are no excuses here. Thank you so much visiting with me, Janet. Albert the Fix-It Man is so authentic that I just knew he had to be based on a real person (or two). Philadelphia has been the home to so many important people and events in our nation's history and in our arts, I can understand how the area can be an inspiration for creativity. Janet Lord earned her BA in graphic arts and advertising from Concord University and now works as a graphic designer. She is the author of Here Comes Grandma! 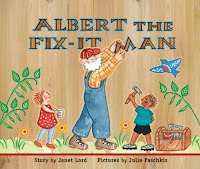 and Albert the Fix-It Man, both illustrated by her sister, Julie Paschkis. She lives in Pennsylvania. Here are covers of Janet's children's books. If you would like read Albert the Fix-It Man with your child or all on your own, be sure to enter my giveaway. To enter, follow the directions on my review post. Great interview! I love the fact that Albert is based on her father, who sounds like such a great guy! That must be so fun, to do a project like that with your sister! Thanks for posting the great interview! I think these books look precious! I'll definitely be checking these out for Booking Son. I love that the effort is "all in the family." What a wonderful family affair! Thanks for featuring such a warm and down-to-earth author. I really like this series. Some good authors up in your part of the woods! Wonderful interview of a woman I'd love to spend an afternoon with. I love the way she sees the community and conveys that in her book. I also like that she and her sister wrote this book together. I have to have these two books now - for the grandkids and myself. Great interview, Beth. Thank you. I'll have to check out the books. I know some kids who would benefit from these. Did she incorporate PA in the story or was it generically located? I can see how a generic location would reach out to the masses but it would be neat to hide a few shout-outs to PA in the illustrations. I know several carpenters, architects and engineers so I am forever in awe of Mr. (& Mrs.) Fix-its. Bumbles: no, the story is generically located -- but a little PA never hurts! I know Janet and she is just an excellent person! Her home brings me joy with all of its creative touches and knick knacks that make me feel at home. I am so happy for her and her family!!!!! I know Janet as well and am a big fan of both her work and her sister Julie's. The little four-year-old twin boys I nanny for love Albert the Fix-It Man. It's one of those books that they never get tired of and I know it will be a book they'll read for years to come. wow what a great tribute to the average tradesperson...wonderful. How neat her father was a mechanical engineer. My husband is one as well. And, my dad is quite the handyman. The cover looks a little retro. Very neat. Great interview. I loved the first question. Too many kids want to be a fireman or police man etc that they don't often think about a guu like Albert. What a lovely interview! I love it that Albert is based upon her own father and that she and her sister have teamed up professionally. What better to write about than what you know best. Thanks for this great interview. I love that Albert is based on the author's father. I have several "Alberts" in my life and it is wonderful to have them! I liked the short interview, very concise and pertinent. Best of all was the author talking of her father - Albert comes alive in those few sentences.